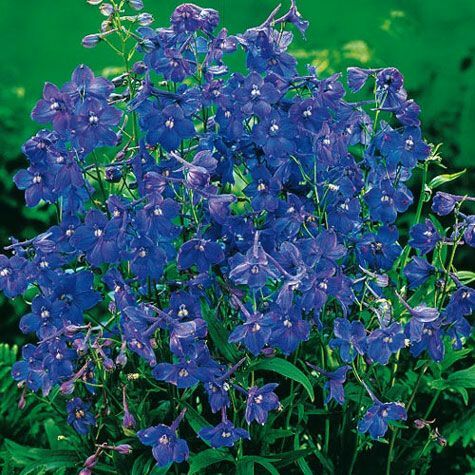 Blue Butterfly Delphinium | Gurney's Seed & Nursery Co. Dozens of deep blue flowers bloom from early to mid-summer. Grows just 14 in. tall - an elegant edging plant along the sunniest side walks. Heat resistant. Bareroot. Depth: Plant the crown(where the roots meet) 1 inch below soil level. Light Required: Full sun (prefers 6 or more hours of sun per day). Foliage: Small, delicate, finely serrated foliage. Blooms: Early summer to late summer. Soil Requirements: Moist, well-drained soil; prefers organic with high fertilization. Pruning: Cut back flower stems to encourage additional blooms. Comments: Mulch in colder areas of country (Zones 5 and below). This flower color is often not found in perennials, making it very unique. Extremely long flowering. True dwarf delphinium that can be used in the front part of a border. Can be used with a number of colors to create dazzling floral displays all Summer long.